The last two races have not gone as well as I’d hoped, and that has dampened my enthusiasm for racing and running in general. Or so I thought. After the last race, I didn’t run at all for a week. The first few days I physically couldn’t. Once I could walk normally again, I felt like I had lost my mojo. I didn’t want to run. I wasn’t running and I didn’t care. It didn’t bother me one but. If you are like me, you know there is something seriously wrong when not running doesn’t bother you. I managed a short run the other day, and then two days slipped by. Finally, last night I went for only my second run in two weeks. It was later than I usually run, but I was determined to get in a run. The temperature was absolutely perfect. It was dark out, but I chose not to use my headlamp. It’s kind of hard to see, everything’s kind of grainy and dreamlike. What I see in front of me looks a lot like what I’ve seen in my dreams. I’m always running somewhere, and can’t really tell where I’m going. A couple miles into the run, I warmed up. I started to remember what it feels like to really run, and I remembered why I like doing this. And then my brain made a crazy connection. In one of the old Super Mario Bros Nintendo games, Mario could jump and then gently float down for what seemed like forever. I’ve often had dreams that I could float like that, and that’s what I felt like. My legs were motoring away in a cartoon circle while the rest of me was completely still. I realized that I was floating along; I was Mario. I felt good. I felt happy. I wanted to run again. Then the choice became clear: Which would I regret more, running a mediocre / bad race, or not racing at all? There are several races that I regret not doing, and I didn’t want this to be another. I decided that I would rather race and whatever happens, happens. But not racing? Well, that’s when you know there’s a problem. And not the good kind of problem. When I got online today, I looked at who was registered. Of all the people I knew, only one person chose the 50K, everyone else chose the 50M. At the Lighthouse race, I chose the 20M instead of the 50K, and I regretted that. My choice was made for me by indirect peer pressure: I signed up for the 50M. Like I had originally planned all along. From what I’ve heard, the course is not technically challenging and there is not much change in elevation. It’s six 7.8 mile loops with a 3.2 mile loop. 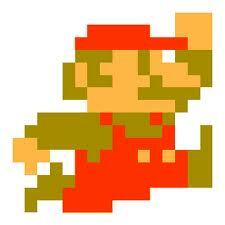 So it should be relatively “easy.” The only goal I have for this race is to channel my inner Mario and enjoy the race.